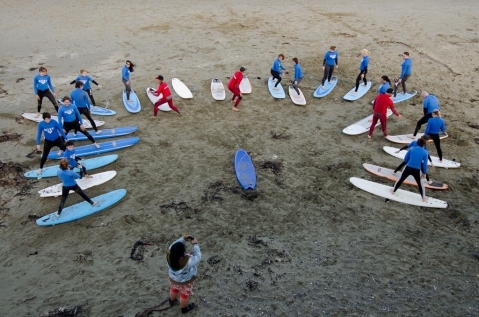 3 x Two hour surf lessons, in which a total of over 60 people took introductory surf lessons in 1ft offshore Lyall bay. Four surf instructors (Montieth, Ratima, Du Burgess, Young), 20 surfboards, 20 black wetsuits, 20 blue rashvests (surfer participants), 4 red wetsuits, 4 red rashvests (instructors). Surf lesson times 11am-1pm, 1pm-3pm, 3-5pm. Particiaption was free to the public by booking with the Dowse Art Gallery, viewing of the work was at Lyall Bay, Wellington, Aotearoa. The work brought together Pacifc Surfari Surf School (Omaha) combined with Kiwi Surf School (Raglan).